I’m clearing out my inbox, trying to tie a bow around this pseudocontext thing. Here are three problems that satisfy the first half of the working definition of pseudocontext. 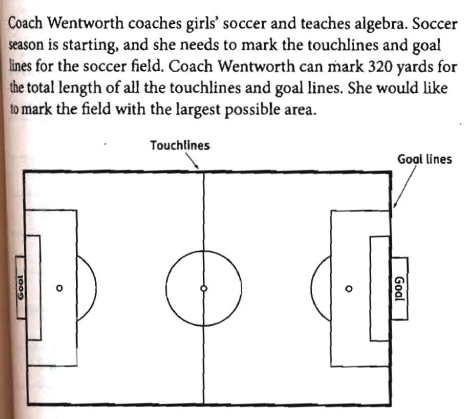 I suppose you’re just hoping no one in the class knows you can’t have square soccer fields. Things don’t fall at constant rates. That isn’t what things do. Regardless of how long someone’s been running or how tired they are, they will always move at a constant speed of 200 meters per minute when running up hill and a constant speed of 250 meters per minute when running down hill. Since runners can only run at two different speeds, there is clearly no acceleration nor deceleration – just instantaneous jumps from one speed to another which coincide with the instantaneous changes between the only two slopes in the math world. A quick aside to the pseudocontext: the problem asks the student to “write an algebraic model” but not before it gives her the “verbal” model. I’m not always certain how helpful to be in these situations but I know you have to be less helpful than that. I’m muddling through a WCYDWT unit on modeling right now and I’m short on data. 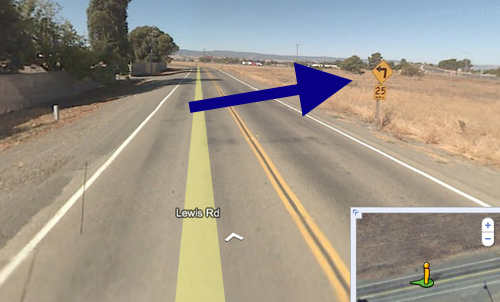 If you know of a curve that’s preceded by a recommended speed sign, would you copy the link from Google Maps and paste it into the comments. Obliged. I have to disagree that this is pseudocontext under the argument that (as I posted on the original CarTalk thread) that a trucker actually came to me with this problem a couple of years ago. He wanted a dipstick method that would give him more accurate fuel readings than his fuel gauge (I guess they’re universally inaccurate?). If a member of a profession brings you a real-life problem from their “world,” I think that has to disqualify the problem from being labeled pseudocontext. Does anybody have a problem with this? I don’t have a problem with this. By Dan Meyer • December 15, 2010 • Comments Off on [WCYDWT] Car Talk, Ctd. I don’t feel that my presentation of the problem did anything to make it any more interesting for the students. I think what interested my students was them doing the following: 1) discovering on their own that it’s not 5 inches, 2) each taking a guess at what the actual length was, 3) understanding that THEY could figure out if their guess was correct or not. Check out Alex’s third entry. On the challenge / rigor side, every student is working on the same mathematical operations. On the investment / engagement side, every student is performing those operations on a guess to which she is personally attached. Who loses here? Nobody. 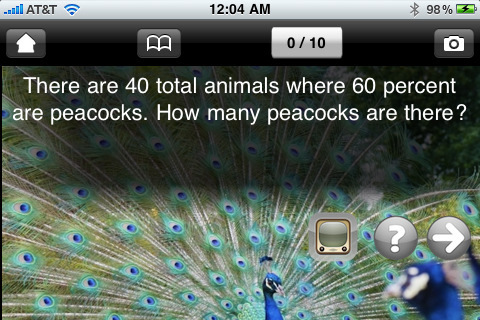 Based on the working definition of pseudocontext, this problem fails on both counts. It completely ignores reality: Why wouldn’t you just fix the gas gauge? Then the problem asks for an irrelevant measurement: Why would we need to know that the tank is one-quarter full? I assumed the trucker wanted to know one quarter of a tank (rather than four fifths) so he’d know when he had to refuel. An arbitrary number maybe (why not one fifth of a tank?) but not irrelevant. As for ignoring reality, I know more about mid-century Russian architecture than I do about long-haul trucking, but it seemed plausible to me that the trucker couldn’t waste time fixing the gauge in the middle of a run. In both of these cases, I deferred to the authority of the radio hosts. If either of Mike’s complaints were valid, why wouldn’t the hosts have echoed them? Mike has also misquoted the definition of pseudocontext in small but crucial ways. Personally, I find the Car Talk problem kind of boring and not very mathematically rich. Another word of caution: Mathematics is part utility and part artistry. By limiting mathematical study to problems related to genuine physical phenomena can only serve to retard the growth of mathematics. It’s worth clarifying my total agreement here. My blog covers math applications pretty much exclusively not because I think those are the only problems worth studying but because those problems are the easiest to create and teach poorly. dissent, pseudocontextsaturday, what can you do with this?